My wife gave birth to our first kid a few days ago on July 30. The boy is a few feet away, sleeping. I have no idea how to write about how he makes me feel. So here’s a baseball card. It features Joe Nuxhall, who was also born on July 30. 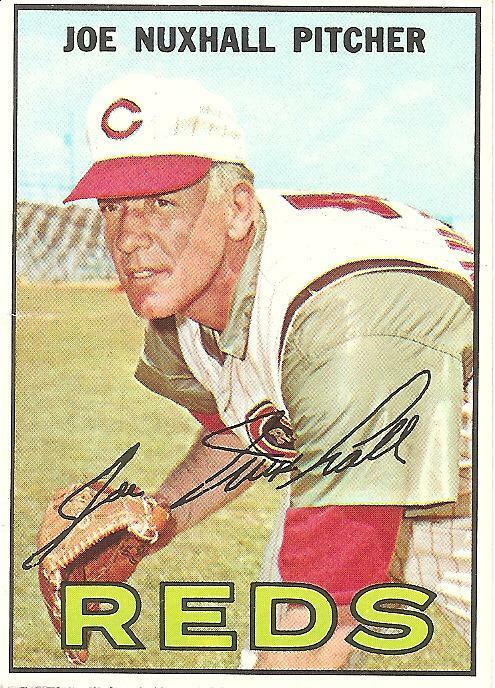 Joe Nuxhall was nearing 37 and had played his last game when this card of him as a gray-haired hurler in what looks to be a rubber undershirt came out. It appeared the year before I was born, so I wasn’t familiar with it until I got it along with some other old cards as a gift from my wife’s mother a few years ago. But when I was a kid I knew about Joe Nuxhall as the youngest to ever play in a major league game, making his debut as a 15-year-old. I remember holding on to that image of him as he was on his first day in the majors, everything in front of him, even as I learned about his actual career, a good one and a long one but one without that purity of a boy standing on a big league mound, readying to fire his first pitch. After his playing career ended, Joe Nuxhall served as a broadcaster for many years, becoming arguably the most beloved figure in the world of the Cincinnati Reds. My boy has some Reds blood in him, his mother born in Cincinnati to a large clan of rabid Reds fans. His first live baseball game, which he snuck into inside his mother’s belly, was a Reds victory over the Cubs at Wrigley earlier this year. Below is a picture of his first contact with baseball outside the uterus. 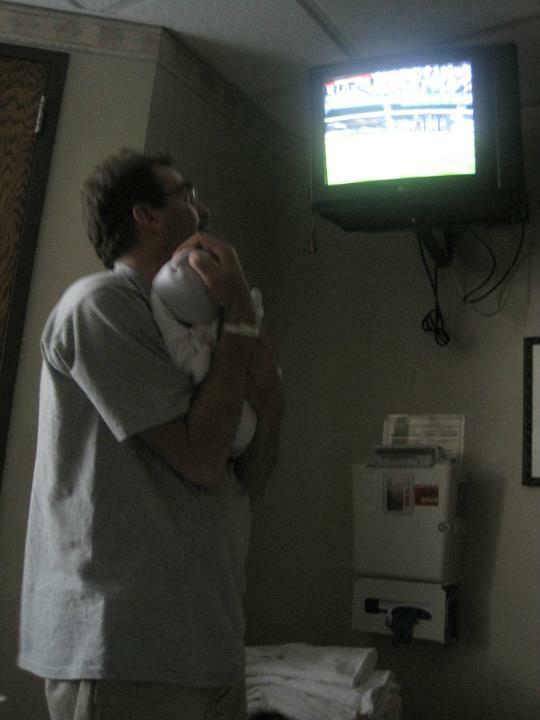 The Red Sox were in town, so the hospital room picked up the local coverage. I whispered into my son’s tiny ear. Youk, I whispered. Yooooouuk. Congrats, Josh! This is great! Congrats! I loved your book – and am Redblood like your wife’s family. Joe Nuxhall was truly beloved in the city and is missed after his passing a few years ago. In some jurisdictions, even whispering ‘Youk’ to a child is considered child abuse. Congrats to you and your wife Josh .. there is nothing that can describe what it is like to be a parent until you become one yourself. Enjoy every moment. Now get out there and buy him a catchers mitt, or teach him to get out lefties in the late innings! I’m so happy for all three of you. There may have been a time when I owned the card that you wrote this post about. The time will come when you are relieved by your son’s gray hair and the life experience it reflects for you, your wife and son. Congratulations Josh and Mrs Josh! Best of luck to all three of you! I really like that you’ve posted this with The ‘Ol Lefthander. I remember my dad telling me about him, still amazed 40+ years later, at the feat of pitching in the majors at 15. “His parents had to sign working papers so he could pitch!” I hadn’t entered the workforce yet so I didn’t really know what that meant, but I knew it was something that was pretty neat the way he was telling the story. Congratulations! Well done on teaching the little one the magic of Yoouuukkk so early. Congratulations Josh! I am so happy for you and your family. Thanks for all the good thoughts! I really appreciate it. Congrats Josh! You are going to have a lot of fun. a challenging thing about being a new father is that you are rarely alone. The great thing about that is that you are rarely lonely. Be sure to get some sleep when you can. Wow – I clearly hadn’t checked back in awhile! Congratulations! Poor guy has never seen the Red Sox win the WS in his lifetime. Better fix that real soon. Josh, first and foremost, CONGRATULATIONS to you and your wife! Sharing your new son’s birthday with my Dad would have made him incredibly happy and my family and I are genuinely touched by your post. Just wish I had found it ON July 30th as it would have been the perfect way to celebrate Dad’s birthday…and your son’s! My best to you and your new family. Play ball! I just saw this today. Another Cincinnati tie – Kevin Youkilis played high school and college ball here in Cincinnati!